The formation refers to the Venus-Mercury-conjunction on July 22, 2016 and in the near future, 34 weeks later, on March 17, 2017. At midnight (sun at lowest point), Venus and Mercury are below the horizon, but the formation is at a higher location, giving a free view to Venus and Mercury after sunset. 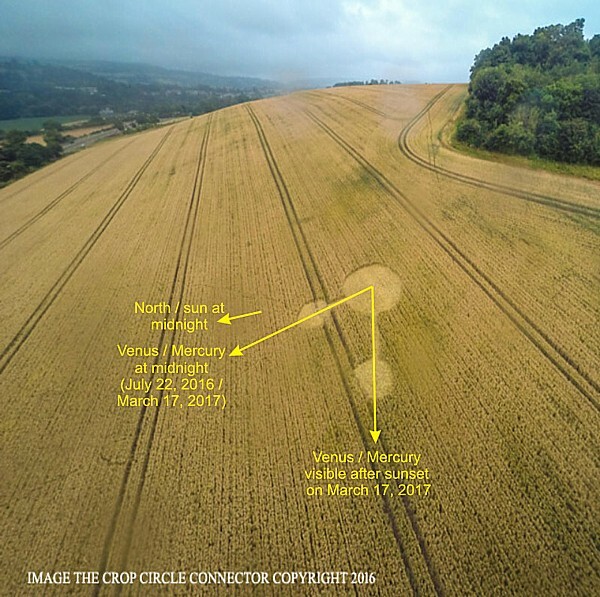 This crop circle is in the same category as the one on July 8, 2016, at West Kennett Longbarrow, near Avebury, Wiltshire. As a result of a comet being moved out of orbit to strike the Earth by the aliens, a fragment has left the nucleus. This is a very common occurrence, especially as the comet nears the Sun. In this case the crop circle looks manmade.